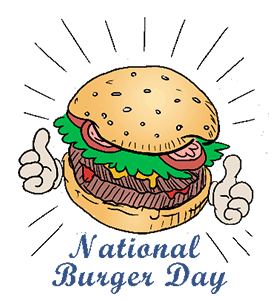 ﻿National Burger Day: Calendar, History, Tweets, Facts, Quotes & Activities. National Burger Day is a day of appreciation for hamburgers. The term hamburger is derived from the city of Hamburg, Germany, where beef from Hamburg cows was minced and formed into patties to make Hamburg steaks. The origin of the hamburger in the United States remains debated, although most claim that the hamburger originated between 1880 and 1900. Since then, this beef patty in a bun has become a global staple of the fast-food diet and the backyard cookout. In recent years, these traditional beef patties have been transformed to include other meat and vegetarian options such as, bison, ostrich, deer, chicken, turkey, veggies, tofu and bean patties. National Hamburger Day is celebrated annually on May 28th. The average American man consumes 6.9 oz. of meat per day, while women consume 4.4 oz. Of this, 55% is red meat including beef, followed by poultry and fish. In 2013, American meat companies produced 25.8 billion pounds of beef. In 2014, the U.S. exported 1.7 billion pounds of beef. The world's biggest burger weighed 2,014 pounds and required a crane to flip. The Guinness World record holding burger was cooked at the Black Bear Casino Resort in Carlton, Minn. The bacon cheeseburger had 16.5 pounds of bacon, 50 pounds of lettuce, 60 pounds of onions and 40 pounds of cheese. In the States, you can buy Chinese food. In Beijing you can buy hamburger. It's very close. Now I feel the world become a big family, like a really big family. You have many neighbors. Not like before, two countries are far away. - Jet Li, Actor, Martial Artist. Host a backyard burger barbecue to celebrate the National Burger Day. 1) Middle Eastern Falafel burger patty made from fava beans and chickpeas. Spices such as garlic, scallions, cumin and coriander can also be added. 2) Lentil and mushroom burger patty made from a combination of lentils, mushrooms, carrots, breadcrumbs and spices. 3) Black bean burger patty made from black beans and spices such as oregano, chili powder and lime juice. 4) Lentil and barley patty made from lentils, barley, breadcrumbs and spices including cumin, oregano, chili powder, black pepper and dry garlic powder. Take up the challenge to create a healthy burger meal. Some options include to replace burger toppings with broccoli and cheese, and replacing potato fries with baked sweet potatoes or replacing the bun with lettuce.